The cotton and sugar industries are looking up in Queensland after several tough years, according to Case IH Marketing Manager, Stuart Brown. Stuart Brown says that planning ahead and implementing strategies to maximise yields is the only way for farmers to survive. Stuart Brown says there is an emerging trend towards relocating cotton farms into northern Queensland. Andrew Keeley is one such grower to move from the Darling Downs to the Burdekin late last year, purchasing 320-hectares to get his operation up and running. “I’ve been growing cotton in the Darling Downs for 10 years and, in the end, I got sick of the lack of water,” Andrew Keeley says. Andrew Keeley’s first cotton crop was planted in December last year and although it is too early to tell how the season will progress, he has a good feeling it will be a success. The big challenge so far has been preparing the land. “We used our Case IH 8950 tractor to deep rip the land and prepare it for the cotton crop,” Andrew Keeley says. “However, because the land had been used for growing sugar cane, we ended up having to hire contractors to go in after us with a rotary hoe. It was the only way we could break down all of the stubble,” he said. “We’ve also got a Maxxum 125 which we’re using for general farm tasks including slashing,” he says. 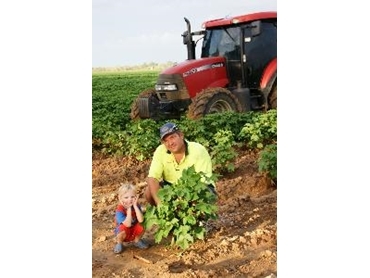 Since 2004, the Department of Primary Industries and Fisheries (DPI&F) and Queensland Cotton have been working to trial cotton crops in the region. Paul Grundy, a Senior Scientist with the DPI&F, said the trials, which began with 28-hectares, have been investigating how to grow cotton in the region. “Northern Australia has difficult pest and weed issues, particularly Helicoverpa caterpillars, but the new varieties – which have Bt (Bacillus thuringinsis, which is a bacteria) technology and glyphosate resistance – have provided a platform to develop sustainable pest management strategies which has really opened up the potential for an industry. Case IH’s Stuart Brown says the industry is looking good for the coming year. The recent wet weather, along with strong forward prices, looks set to return the cotton crop to two million bales plus, and the industry is already working toward ensuring the infrastructure is in place to handle the increased volume. Stuart Brown says, “It’s looking like we might actually have an industry again. Sugar growers are also introducing interesting strategies to cope with industry pressures, particularly volatile prices. “For example, a growing number of farmers have been planting cane on dual rows to increase yields. It does lead to higher water and fertiliser use, but this is offset by increased tonnage,” Stuart Brown says.